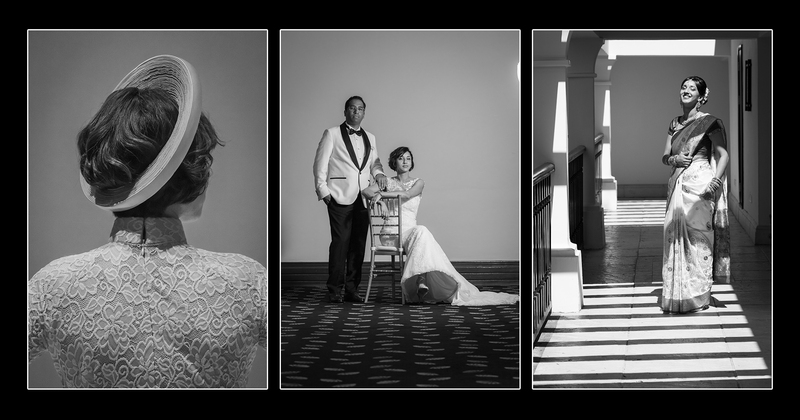 During my career in wedding photography I had the chance of being part of several weddings – and each one was special and wonderful in its very own way. The wedding of Elodie and Hassen, who got married recently in the Hilton Mauritius Resort & Spa, situated at Flic-en-Flac , created a lasting impression – lovely couple, a great gathering of family and friends…and three astonishing dresses. The Ceremony was held on the beach of the Hilton Hotel, in an incredible, colourful setting, lovingly designed by Eva and Karen from the wedding planner agency, Carte Abricot. Their professional and affectionate planning guaranteed a smooth and hassle-free wedding day. Mother Nature was our guess and she was wearing a beautiful blue sky and golden sunlight attire, who perfected the scenery. The groom Hassen, was accompanied down the aisle by his cherished mother, walking to the eagerly awaited moment in a confident step. A few minutes later, Elodie followed him, guided by her beloved father. Newly-Wed along side their beloved relatives. After the ceremony, there was a relaxed and friendly atmosphere surrounding the newly-wed couple, families and friends. The videographer, Gonzalo Fanny, spread additional positive feeling to the whole crowd on using his creativity to carry along the whole family into the ‘rollercoaster’ of a freestyle choreography…resulting in a bunch of joyful and creative images of the whole family. Thereafter, while the family was enjoying the stunning floral garden and tasty cocktail at the Hilton Resort, I took the chance to capture images of our newly-wed couple, Elodie and Hassen, alongside the seaside and the jetty who lead to the sea. Shortly after sunset we all gathered at the Hilton Venue Hall for the night celebration. Red Carpet with candle light on the side was awaiting our guest. Family and friend walk side by side to the door of the hall where the dynamic music of Charlie Wilsons “Good Time” lead their entrance pace into what I will classified as joyful and energetic. Our newly-wed couple , Elodie and Hassen, close the march. They were dressed in a marvelous classy and elegant attire. During the evening, a relaxed atmosphere alternated with touching speeches provided by family members and friends. Later on, surprisingly a group of sega musicians and dancers step into the room with their colourful dresses and remarkable choreography. The rhythm of the swinging music carried the guess to the dancefloor. As the evening proceeded, it was soon time for the traditional toast. Elodie appeared in an exquisite red dress, honouring the Vietnamese roots of her family. All in all, the wedding of Elodie and Hassen was a great day, giving me lots of opportunities to capture the joy, affection and love between the newlyweds, their family and friends through my lens. Thank you all for this amazing day and my very best wishes to you for your future. If you would like to see more of my work, I invite you to visit my online gallery and to know more about me, please visit my biography page.